The Magician represents consciousness, action and creation. He's the symbol for the idea of manifestation - the possibility of making an idea come true. He gives meaning and direction to life, and he reminds us that the emotional and creative powers of our souls must have a physical basis to be of real use. Powers unused are powers non-existant, we have to set them free in order to use them, and to gain and renew. 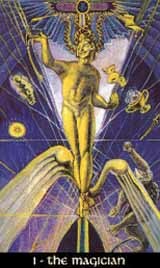 The Magician is related to the Mercurius of alchemy. The Magician shows that we're aware of the power in life, he can be a symbol for all the creative skills and ideas inside. Most people don't really act, they just react, being driven from one situation to the next. The Magician tells that a power is ready to use as soon as it is recognized, to see and go the own way. The negative side of the card could mean that the free run of energy is blocked, that we can feel the enery but can't use it. This could mean fear and restlessness, even the fear to go insane. Energy tends to explode when not finding a ventile. Finally there's a negative aspect in the abuse of energy.